I love looking at all the street style pictures from New York Fashion Week. I find them even more inspiring than the actual fashion shows! Each NYFW I pour over all the pictures and save the ones I want to re-create. I often find creative combinations that I wouldn’t have thought of on my own! The outfits may not look practical in the pictures, but if you take certain elements you can create a look that is wearable but still stylish. 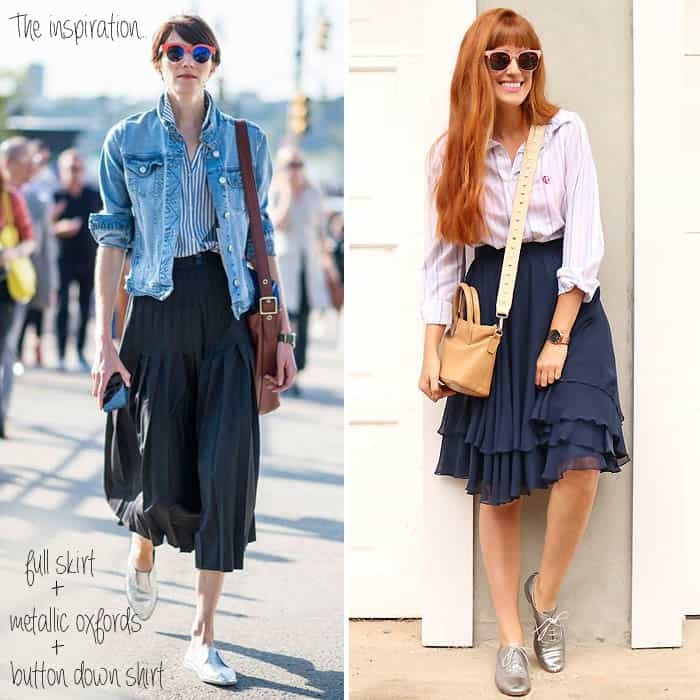 Today I teamed up with Dr. Scholl’s Stylish Step™ to show you 3 street style pictures that I used for inspiration to create my own NYFW Street Style Inspired Looks. Obviously, super-chic shoes are a major part of street style. Oxfords, sky high heels and everything in between top off the outfits of the fashion industry’s best. 5 inch heels might work if you’re wearing them to a fashion show for an hour, but do you really want to spend all day in them? Yeah, me neither. I need my shoes to be comfortable…especially since I’m frequently chasing after a toddler! 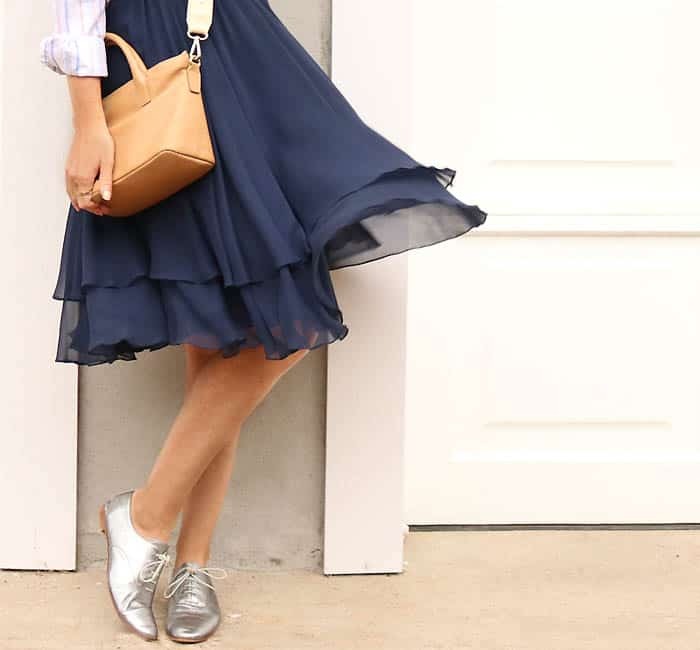 Dr. Scholl’s Stylish Step™ up the comfort level on any pair of shoes! There’s a wide variety of different insoles and liners to solve any and all of your shoe problems. 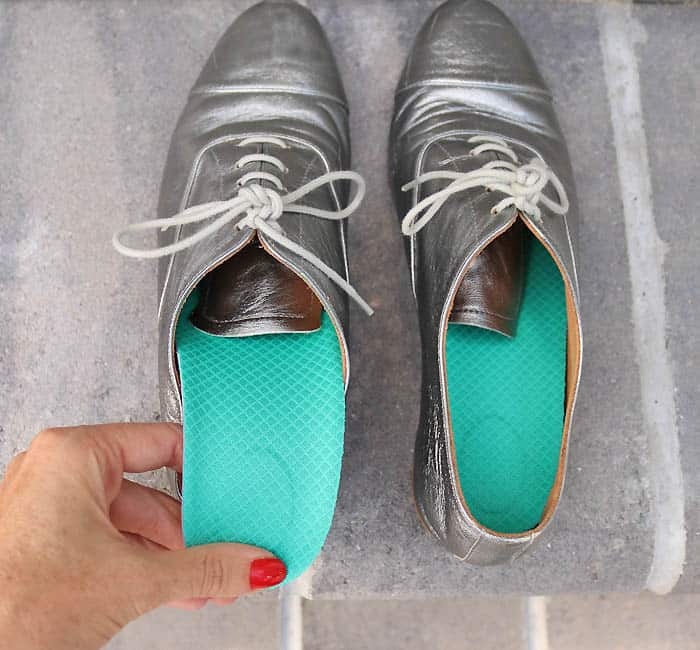 I decided to give Stylish Step™ Extended Comfort Insoles for Flats and Stylish Step™ Gel Heel Liners a try. I love these silver metallic oxfords, but thanks to the thin sole, they’re really not that comfortable. 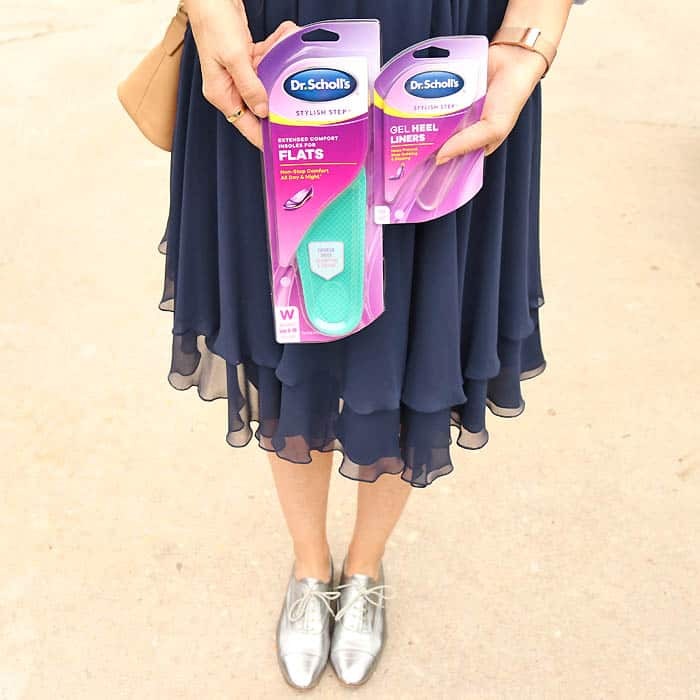 I added the Dr. Scholl’s Stylish Step™ Extended Comfort Insoles for Flats and they felt like a new pair of shoes! The insoles provide superior shock absorption and cushioning. The slim design didn’t make my shoes feel tight. These oxfords went from being “2 hours max” shoes to “all day” shoes! Now that these oxfords are actually comfortable enough to take me through the day, I figured I’d incorporate them into one of my NYFW Street Style Inspired Looks. I love how this woman on the left takes a dressy skirt and pairs it with all casual pieces. It’s a great reminder that dressier/evening pieces can be worn during the day if you style them right. I usually wear my metallic oxfords with jeans, but after seeing this NYFW look I decided to try them with a full skirt. This outfit is really comfortable (thanks in part to the Stylish Step™ insoles!) and it makes me more put together than jeans and a basic top would. I love the playful vibe of the outfit above! 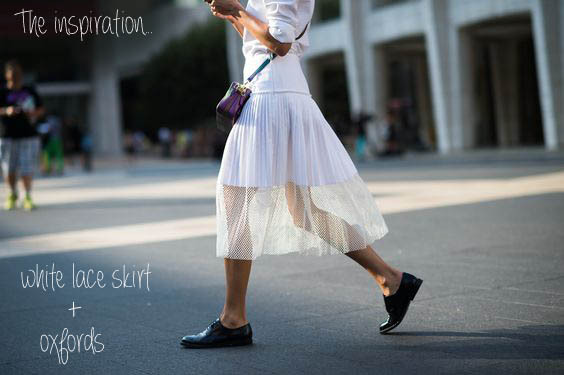 This unexpected pairing of the white lace skirt and dark oxfords is so unexpected! This is also a great way to get some extra mileage out of your summer dresses. 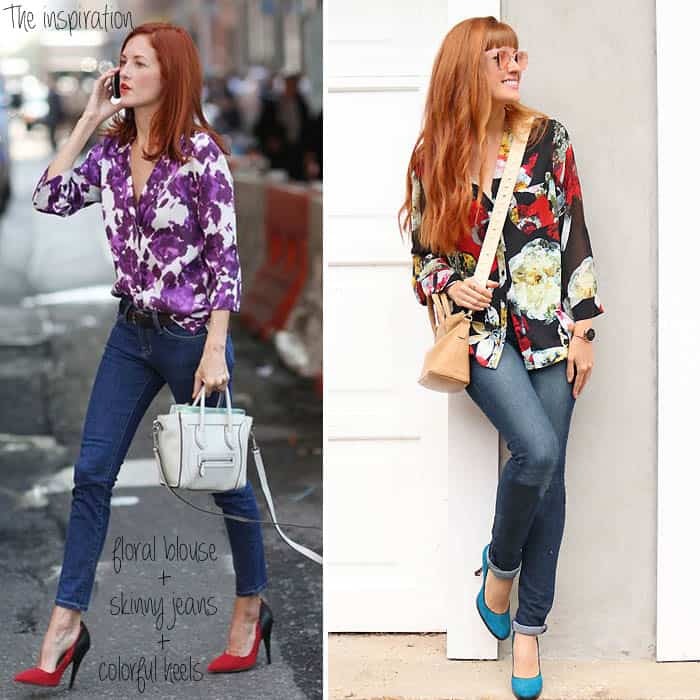 I re-created the look below with a white lace dress and two toned oxfords. I had planned on putting this dress in storage at the end of the summer but after trying this look, I think this dress can work for fall. Taylor Tomasi Hill (pictured above, on the left) is my favorite NYFW street style star. I love her use of color and her chameleon style! This outfit takes basic items (skinny jeans, blouse) and pairs them with a bright, contrasting heel. These blue heels are pretty comfortable (as far as heels go), but if I wear them for an extended period of time they hurt the back of my heels. I inserted the Stylish Step™ Gel Heel Liners and it was a huge improvement! With the Stylish Step™ Gel Heel Liners, my heels were no longer rubbing against the stiff leather back of the shoe. These heels went from comfortable to very comfortable with the addition of the Gel Heel Liners! Dr. Scholl’s Stylish Step™ insoles are available at Target in the footcare aisle near the pharmacy. Stylish Step™ provide you with all-day comfort so you can wear the shoes you want for longer. Be comfortable and look great! Right now you can get 10% off on Stylish Steps™ insoles at Target. Find out more here. What’s your favorite part of NYFW? I’d love to hear!